Realms Beyond, the much-anticipated Chaos Chronicles successor from Ceres Games, is also at Gamescom this week. For such a niche and largely unknown title, it seems like it's doing well there. They even won an award for best indie booth today. Mega-fan BEvers has been keeping a close watch at the game on our forums via Twitter and Instagram posts. 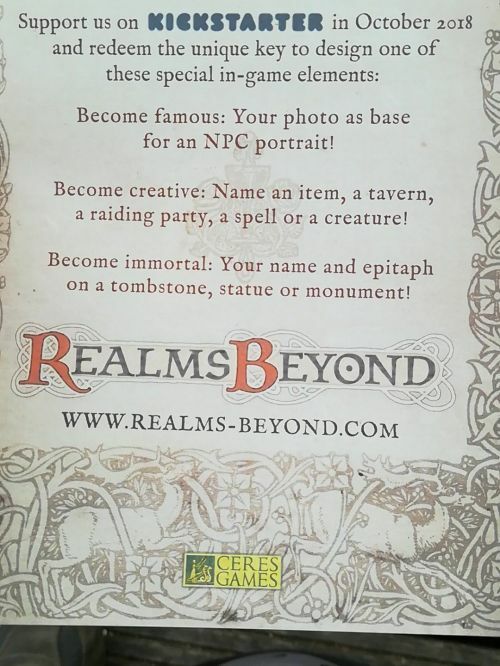 Thanks to him, we learned on Tuesday that the Kickstarter for Realms Beyond is scheduled for October, something which Ceres confirmed on their blog the following day. But that's not all. In a surprising twist, it turns out that none other than Guido Henkel has come out of retirement and has been working on Realms Beyond since the very beginning of its development, helping to craft its story and setting. Truth be told, this is something that user AbounI quietly spotted just days after the game was announced back in December. Yet despite being quite active on the official forums under the pseudonym "Dragon", for whatever reason Guido only publicly confirmed his involvement with Realms Beyond last week. In fact, Ceres have yet to mention his name in any official capacity. Maybe it's supposed to be a surprise for the Kickstarter? UPDATE: It turns out that Guido was part of the Realms Beyond team, but left at some point. Whoops!